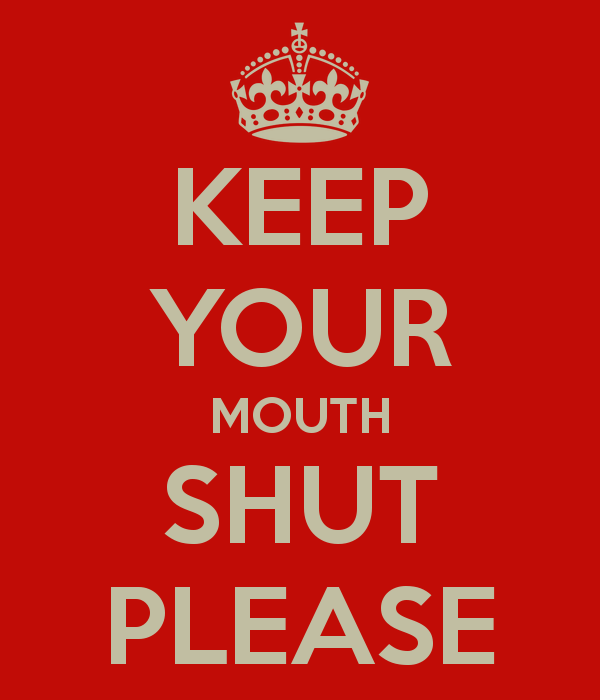 Myss Lafunky's Blog: Would You Keep Your Mouth Shut? It's a New Year! How are you settling into the New Year? Have you met your target so far? Have you written down your vision for the Year? For one of my readers and followers, God wants me to tell you that He created the heaven and the earth in 6 days and He will sort out that particular issue in less than 5 days and all you need to do is to believe in Him and to sing praises unto God. Today's topic is about holding our tongues. 1) In what ways do talking too much affect your relationship? 2) How would holding your tongue help you avoid sin? 3) Does silence truly indicate wisdom, or is it sometimes another way we choose to keep malice and punish others? Can our silence be deadly? Jo is married to Sarah, Jo complains about every thing around him, even at his place of work, he looks for things to complain and moan about. Jo gave his life to Christ over 5 years ago, yet he has not done away with grumbling and complaining that he struggled with in the past. Prior to giving his life to Jesus Christ, he criticised and grumbled over every little thing that happened at home. Jo rededicated his life to Jesus Christ about a year ago, he made up his mind not to grumble about people around him and about his family. However, the grumbling continued. Jo and his wife argued so much that it affected their marriage and children so much that their 5 year old son has been known to bully other children in class. Jo is vicious in verbally attacking his wife and children, he makes statements such as; " You are so stupid", " You are so dumb", "Are you blind?" Words like this cut so deep in Sarah. Over the course of the years, Sarah has learned to study the book of Proverbs in the Bible and started implementing what she had been studying. Recently, Sarah felt like responding to her husband harshly when he shouted but she used her discretion by not speaking to Jo when he spoke abruptly. Gradually, Jo calmed down as he realised that he was not getting any negative reactions from his family anymore. He has also learnt from reading his bible that, it is a fool that gets angry about things, and it is someone that lacks God's love and gratitude that complains and moan about things. Reflect on This: Would you agree that it is always tempting to add our bits to an argument that would cause more problems? I have certainly been there; there have been situations that I added my voice to contentious issues which flared up and led me into trouble. I have also been in situations that I could have responded harshly, however, I kept quiet and I chose my words carefully before I responded. Guess what? I reaped the benefits as the issue was solved amicably. Do you know what the Bible says about holding your tongue? The book of Proverbs 10:19 says that: "when words are many, sin is not absent, but whoever restrains his or lips is wise." How are you holding your tongue in conflicts and disagreements? Proverbs 21:23 states that: "if you keep your mouth shut, you will stay out of trouble." In other words, if we say things that are not right or unkind things, it may come back and haunt us, and God is very likely not to be pleased with us when we get into trouble with our mouth. Furthermore, remember what the word of God says; God said that "we will give account of every idle word that comes out of our mouth". That is so scary, isn't it? I wonder how God would rate me on the idle words that have come out of my mouth and your mouth. The next time you find yourself grumbling, engaging in verbal altercations, and complaining, etc. Ask yourself, are my words seasoned with love? Patience? kindness? Gentleness? (Galatians 5:22-23) or are my words seasoned with hatred? Anger? Envy? Jealousy? Hurt? Pride? Resentment? Unforgiveness? Ingratitude? Be wise and hold your tongue. See you next week. Remember to share this blog with your friends and your social media friends. The more we get to know God the more his traits grow in us. Getting a word to say in everything shows knowledge and development in information but when a word fans the flame the more it call for caution. We must allow the Spirit of God regulate our utterances so that we speak in such a time that peace would be generated and a calm would be maintained. we are ambassadors of peace as God is a peace maker and is known as the prince of peace. Yes we are ambassadors of Peace.